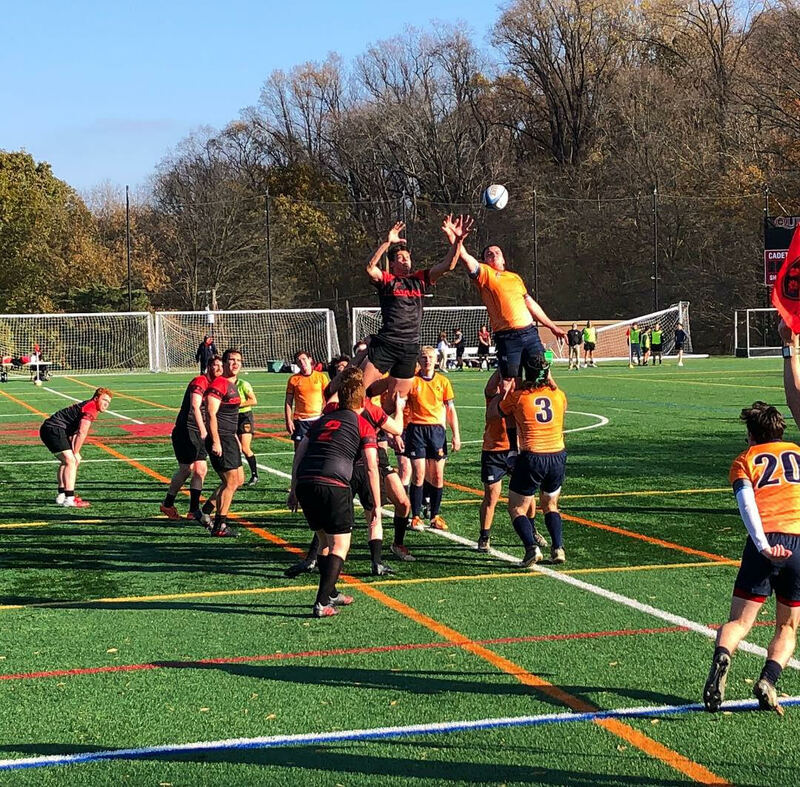 The Catholic University Men’s Rugby team hosted Bucknell University at St. Johns High School in Northwest D.C. in the South Atlantic Qualifier Match on a sunny Saturday afternoon on November 17. The Cardinals were ranked 4th in the club division and Bucknell was ranked 15th. The Cardinals are now moving to the Sweet 16 in Raleigh, North Carolina December 1-2 as part of the National Small College Rugby Organization (NSCRO) National Championship Bracket. The NSCRO is a rugby league created for smaller schools such as Catholic to compete at a national level. The fall season consists of NSCRO conference matches for a chance to enter the national playoff in the spring. The playoffs consist of Sweet 16 and Elite 8 matches. In the game of rugby, players can only pass the ball backwards and run or kick the ball forward. A lot of passing and coordination takes place with each teammate to get the ball to move forward. Senior Mark Scarlett plays as a wing on the team. As a wing he finishes the plays, and stays outside the play for other people to set him up so he can beat people to the ball. Scarlett attributes their win to the experience and teamwork on the field. “This year we let all of our players touch the ball a little more,” Scarlett said. To tackle, a player must release the ball to their teammates to pick up, but the other team can steal it. In a ruck, the teammates stand over the ball carrier and the ball to stop the other team from getting the ball. The ruck sets an offside line where the defense waits to attack, and the offense sets up its play behind it. When the ball leaves the ruck, the play starts and the defense moves up on the field. Players cannot tackle above the chest or it will be a penalty. In the game of rugby the goal is not to tackle, the goal is to get the ball. A scrum takes place when a team passes forward, drops the ball or stops the game. In the scrum eight players from each team line up and push each other for control of the ball which is placed by one team in the center. Junior John Flynn is the president of the team and plays prop. As prop, he plays in the front of the scrum and contributes whenever he can to defense and offense in the rest of the game. Flynn described the strong senior class, and how the team has grown in the past couple of years. In rugby, a score is called a try. A try is like a touchdown, but the player must touch the ball down on the ground of the end zone for the five points. A conversion is the two point kick after the try. The player must kick the ball from the same point on the field where the ball is touched down. James Tweedy is a senior who has been on the team for four years and is one of the team captains. He scored over a dozen points in conversions while running up and down the field passing the ball the whole game. In the first half of the game when Tweedy was running by the stands, one of his friends yelled that he was out of shape. Tweedy, who was trying to catch up with the other players stopped running, looked at his friend in the stands and patted his stomach. Senior center Matt Longfellow scored five tries against Bucknell and is being considered for the All-American team. “I am basically like a running back. I take the ball from James Tweedy and coordinate the offense in a way of finding the holes and moving the ball to the outside,” Longfellow said. Wes Krol scored the second try, making the score 10-0 and Tweedy made his second kick making it 12-0. At halftime the score was 24-0. Right after halftime, team captain Dylan Bonsignore scored, making it 29-0. The men continued to play their own game of passing the ball around. The more they passed the ball, the more they scored. Joseph Garthaffner scored and Tweedy got the conversion. With 32 minutes left in the game, the score was 36-0. At the end of the game, the Cardinals’ defense weakened slightly, allowing Bucknell to score, although they missed the try with the ball bouncing off of the field goal. The final score of the game was 43-5. This year, the team has also improved their overall fitness, working hard off the field. “They gave us a really hard 15-20 minutes but we were in better shape so we were able to play the long game with them,” Longfellow said. With nine seniors on the team, the players know each other really well. They can predict each other’s speed and momentum so when they pass the ball to one another they know how and when to throw it. The men are excited to go to Raleigh to play the Sweet 16, taking on Eckerd College on December 1.